Can you get all the cauldrons where they belong? 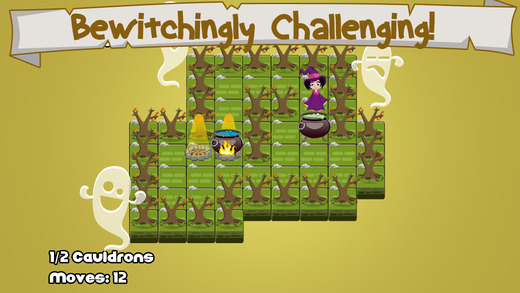 The puzzled witch is back, and still needs to get her cauldrons onto the fire in order for her spells to work. With only a limited number of moves to make, this game really gets you thinking! Get creative and figure out the best way to get the cauldrons over the fire. Each level will get harder and harder, so don’t get too comfortable! This app features five worlds and 50 hand crafted puzzle levels! Each world features unique graphics for that world such as pumpkins, candles, skulls and gravestones. 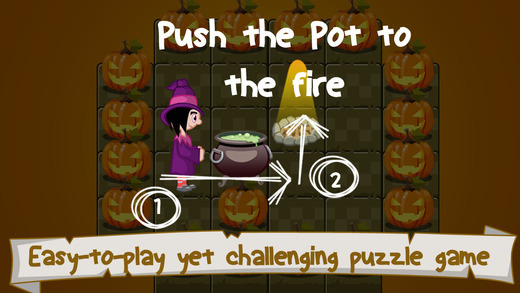 This little witch and her puzzle will keep you entertained for hours, and you’ll quickly become addicted! It’s a great break during the day, or to keep the kids busy. Play against your friends to see who can get the highest score.